GardenWise with Edible Flower Power! A Tasty & Fun Garden Project – Edible Flowers! I think the best first garden project for Spring should always be a fun small side project that you can successfully complete in a short period of time that will yield quick results. It’s such a confidence booster to have a great success under your belt as you prepare to undertake larger garden projects over the next three seasons. An edible garden is a great small project to think about for Spring that will become a favorite gift that keeps on giving. It can be difficult to find edible flowers to purchase, but they’re easy to grow yourself. And there’s no greater personal touch when cooking for family and friends than adding edible flowers grown right in your backyard. Lavender, Marigolds, Thyme — they’re all edible! For the freshest tasting goodies, your edible flowers should ideally be harvested in the cool, morning hours. If you’re not going to use the flowers immediately, cut them with the stems intact and keep them in water. You can also store them in damp paper towels in the refrigerator. Lavender has a sweet floral flavor, with a hint of lemon and citrus. Use as a garnish for sorbets or ice cream. Lavender also goes well with savory dishes. 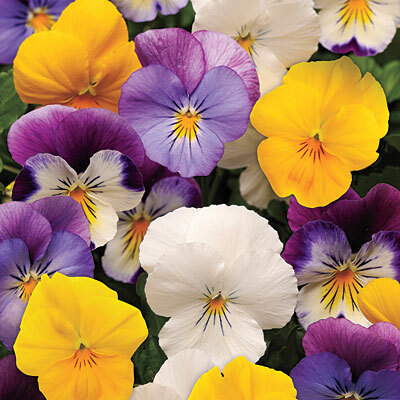 Violas give a sweet perfumed flavor. The tender leaves and flowers can be eaten in a salad. Or the flowers can beautifully embellish desserts and iced drinks. Sage flowers have a more delicate taste than the leaves, so be sure to be careful when pruning. Sage can be used in salads or as a garnish. Lemon balm is indigenous to Southern Europe but is now cultivated worldwide. Lemon balm flowers have a gentle lemon scent and can be used as garnish. Oregano can be found growing wild on mountainsides of Greece and other Mediterranean countries where it is an herb of choice. Oregano flowers can be used as you would the herb; it’s a milder version of plant’s leaf. Marigold flavors range from spicy to tangy. Their sharp taste resembles saffron and the plant is sometimes referred to as poor man’s saffron. Their pretty petals can be sprinkled on soups, pasta or rice dishes, and salads. Nasturtium blossoms have a sweet, spicy flavor similar to watercress. Their leaves add a peppery tang to salads. Use the entire flower to garnish platters, salads, and savory appetizers. Nasturtium seeds are edible as well when they are young and green and have been likened to capers when pickled. Like sage, thyme flowers have a milder taste than the leaves. Use as you would the herb — the flowers also make a beautiful garnish. Each brick used in the above GardenWise, Inc. designed and installed garden space in Washington, D.C., was recycled from the previous garden space. 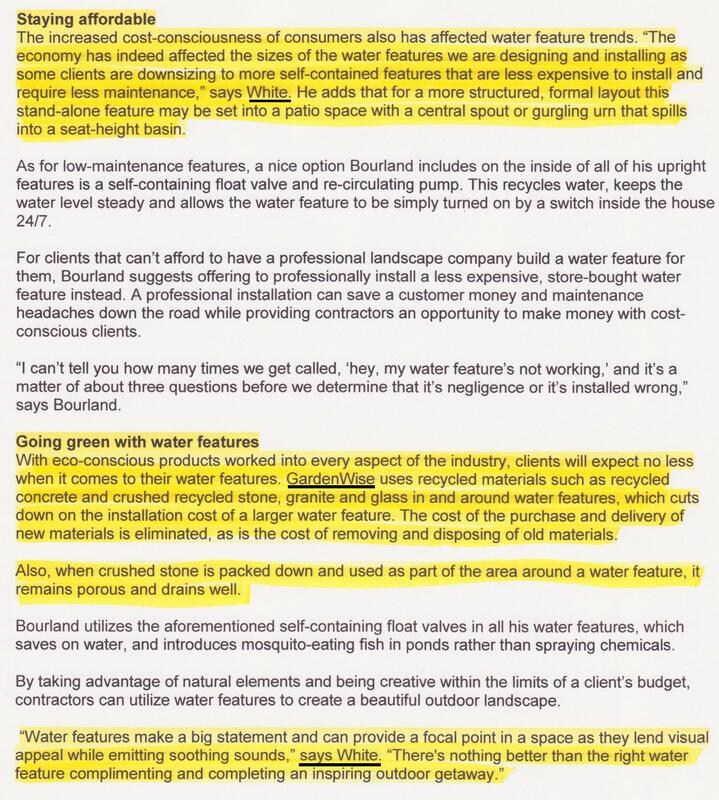 Landscape Architects are paying closer attention to “green” projects more and more. Using recycled materials is one way GardenWise helps our clients take a great “green” step when installing a stone or brick design. We use recycled materials whenever the chance to do so presents itself, and the possibilities are endless: recycled concrete for paving systems, glass in stepping stones, recycled bricks, and crushed stone and granite to be used in patio surfaces. An added bonus? You save money! When I incorporate larger pieces of old concrete or bricks into a design, the purchase and delivery costs of new materials is eliminated. 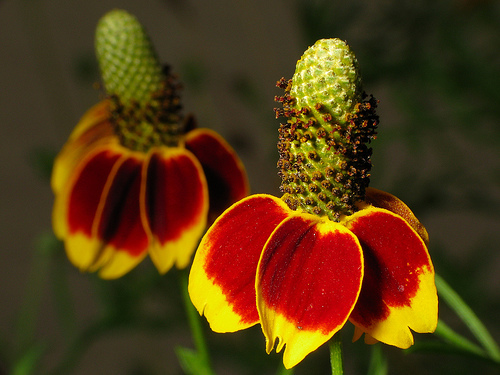 I was going to do a lengthy post today about fantastic colors for your spring garden, pointing to the Red Prairie Coneflower, pictured, which is a beautiful coneflower that will add fantastic and eye-catching color to your garden. You won’t be able to pass by this beauty without stopping to get a closer look each time you walk by. Late spring is a great time to take a close look at your garden to decide where you need to make some changes. Truly memorable gardens get their character from lovely bones — benches, water features, garden accents, sculptures, containers and planters, stone work, arbors/pergolas, custom fences and gates, terraces, patios, garden lighting, and edging around your plant beds. Many first time gardeners are often surprised and discouraged when they find their lovely and very expensive collection of plants are nothing more than too many random plants piled together in a forgetable outdoor space. Take the time out now to think about your garden’s bone structure. When you add architectural elements to your garden spaces that can include a bench, stone accents, an arbor, landscape lighting, a patio of flagstone, and a curving stone path to lead to your large grouping of beautiful plants, your garden will come to life, and you’ll forever change your home life. 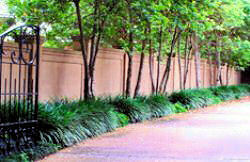 A thoughtful way to live a greener life is to make your landscape eco-friendly and plant trees. Planting a tree is one of the most immediate green steps you can take as trees absorb CO2 and other dangerous gasses while replenishing the atmosphere with oxygen. Canopy trees, and Deciduous trees that grow tall and full in the summer, will add shade to your home and help it stay cool in the summer months. They will also allow your home to absorb warm sun light in winter. In addition to being good for the environment, adding these trees to your landscape is an energy saving step that will lower the cost of cooling and heating your home. Another group of trees to think about planting are Fruit bearing trees which will also absorb dangerous gasses while replenishing oxygen. 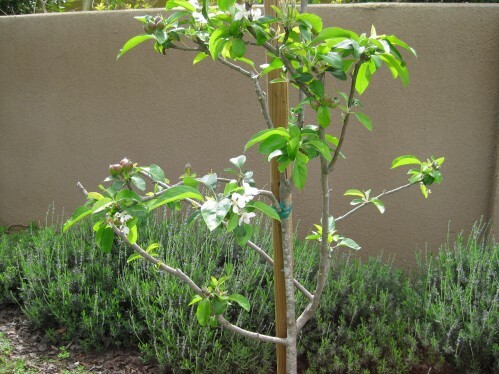 A big plus in adding some fruit trees to your garden space? 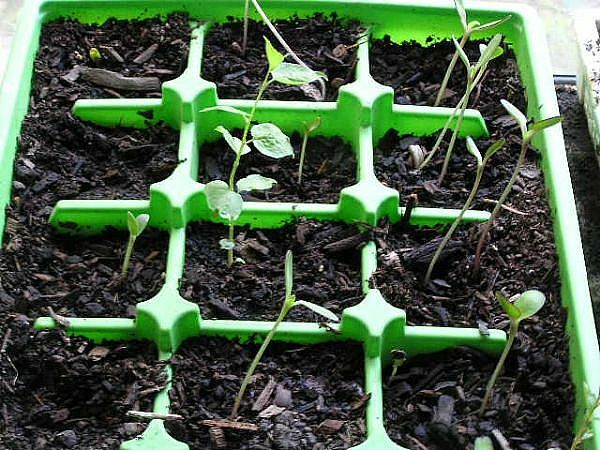 Your garden will become much more productive. While enjoying your favorite fruits and saving a little money at the grocery store, you can also donate any extra fruit you grow to those in need. Not only will you help others in your immediate community, but you’ll show by example how Green Living can give back, both locally and globally. I worked Francesca Clarke at AOL’s DIY Life Network on a feature story about creating green structures with trees and shrubs for privacy in your garden and outdoor spaces. There are many options available for all budgets and timelines, depending on how soon do you need a privacy screen from a neighboring home or structure and how quickly you want to block unwanted views. 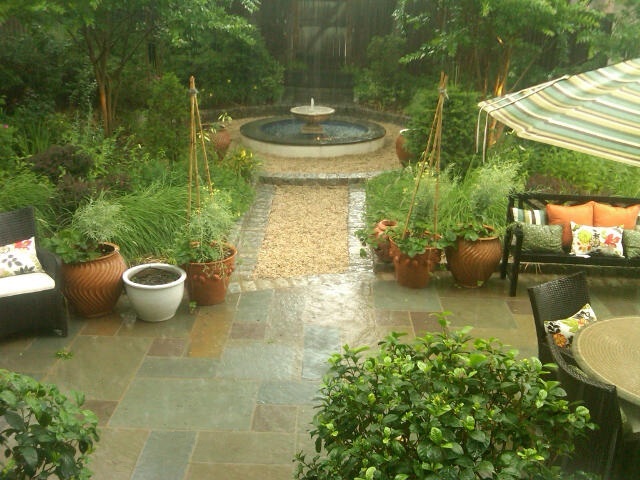 Pictured is a GardenWise garden in DC which includes Black Bamboo which serves as a screen. I recommend to my clients if they have the space is to off-set the shrubs you use for a privacy screen and consider using different heights for a more natural affect. Also, if a plant dies with staggered plant scheme along with the varying heights, the gap created by the dead plant is not so obvious. The back row should have the tallest plants that will create the screen. The middle row should have medium height plants, such as a smaller deciduous shrub such as an Annabelle Hydrangea, which will offer texture contrast and offer summer color. The front row should be composed of your shortest plants and evergreen ground cover, such as variegated Liriope, which is grass like and has the added bonus feature of a late summer spiky lavender colored flower. Another striking affect I like is to use the purple coneflower and the Russian sage against the pendulous white blossoms of the hydrangea will be smashing. Unity in an outside space is the best way to quickly provide a stimulating visual. 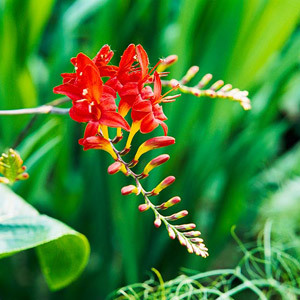 Crocosmia: Pictured below, adds an exotic touch to your favorite home grown arrangements. This gladiolus relative bears clusters of bold red, orange, or yellow flowers that always seem to be the center of attention. Yarrow: It’s beautiful and tough. In fact, this is one of the most maintenance-free perennials you can grow. 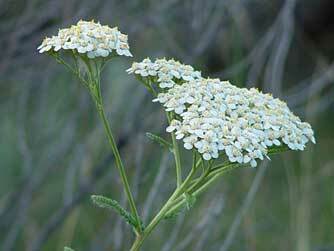 yarrow resists heat, drought, deer, and rabbits. It’s also a blooming machine, producing flat-topped clusters of yellow, orange, red, pink, or white flowers throughout the summer. Bearded Iris: Bearded iris (also called German iris) provides a striking vertical accent with its stiff sword-shaped leaves. Flower colors run the rainbow from deep Burgundy red to pastel pinks and yellows, to every shade of blue and violet and appear in late spring. Blazing Star: A N.orth American native, blazing star has spikes of white, rose or purple flowers that attract butterflies; a great plant to add a vertical element to a garden. The blooms are ideal for cutting/drying. 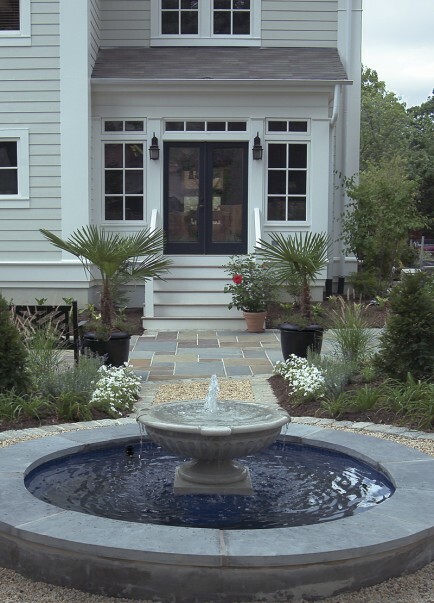 When you think about your outside spaces, take it to the next level and add a water feature! 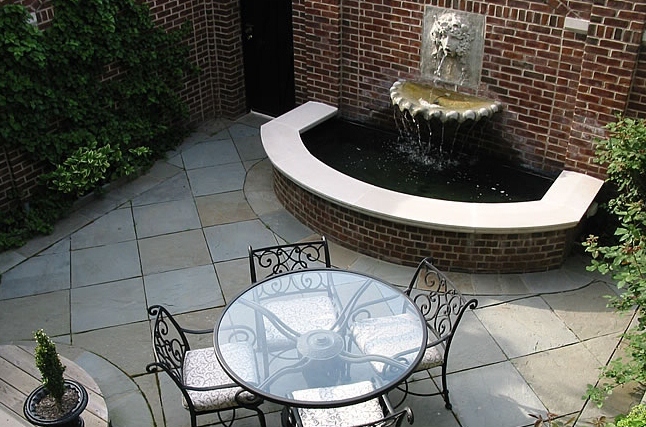 Fountains and water features come in many interesting shapes and sizes and can deliver transforming results. There’s something about water and the sight and sound of it trickling and tumbling over stones and splashing into a pool. It’s one of the most enjoyable and relaxing additions to any garden. When the sunlight sparkles and all the colors from your garden appear in the water’s reflection, you’ll be hooked! An added bonus? The birds you’ll attract with a fountain will make for a great natural pest control and improve the fertility of your soil. And with a good supply of water in your garden, they’ll eat less of your fruits and vegetables. We’ve written a lot over the past two years about losing at least HALF of your lawn areas to create a “greener” more eco-friendly garden. Losing some of your lawns areas is a fantastic way to make your garden space less water needy — and it will introduce new options to make your landscape current and interesting. Replacing lawn areas with ground covers is a great option I recommend everyone to consider. And remember that if you position numerous species of ground covers together in large groupings, it will add much drama to your space, in addition to both color and texture. 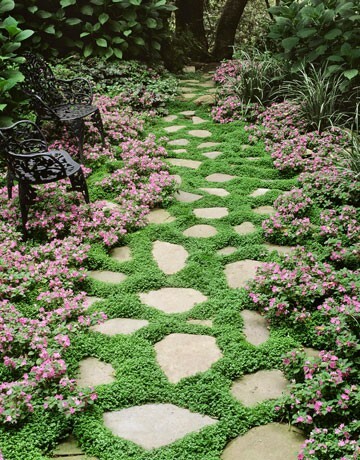 Think about creeping Jenny for a sunny areas and Creeping mints for shadier spots. And trailing yellow dale and trailing Lantana. What to really ramp it up? Bring your sense of smell into the mix and add a fragrant ground cover, such as Sweet Woodruff, to your garden space. If in the end your heart belongs to grass, think about replacing your lawn areas with grasses and grass-like options such as pink mulhy grass, liliope, deschampisi caespitosa (aka tufted hair grass) or mondo grass. You’ll need to water your grasses and ground covers adequately until they’re established, after that, depending on the type, you’ll find your ground covers require up to 100% less than your former lawn areas. It’s hard to clean behind latticework, so a great alternative that allows you to get behind this wonderful garden accent is to make a hinged trellis that swings open! Start by fastening a strip of 3/4-by-1-inch wood to the wall about one and a half feet from the ground. Screw hinge plates to the underside of the strip and the bottom of the trellis. 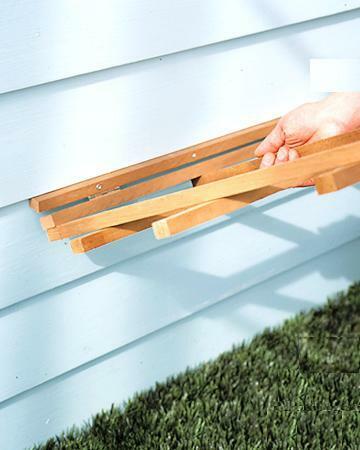 Attach another wooden strip to the wall at the level of the trellis’s top crossbar. Screw metal eyes into the strip’s ends and metal hooks into the ends of the crosspiece so the trellis can be unhooked and pulled away. It’s a fairly simple garden project to do and can be comleted in just an afternoon! “Zoysia is a warm-season grass native to China, Japan and Southeast Asia. 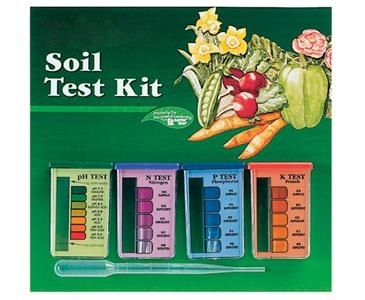 It’s highly adaptable and can be grown in all types of soils from clay to sand, as well as in either acidic or alkaline soils. It requires little moisture and stays green during even the hottest days of summer. (GardenWise’s) Mark White, a Washington, D.C.-based landscape architect and member of the American Society of Landscape Architects (ASLA), describes zoysia as a “wonderful grass – beautiful, thick and lush.” He grew up sliding on zoysia-covered hills in his parents’ yard and remembers it being dense and lush, an ideal lawn to play on. PS – The home featured in the magazine is my house in the Cherrydale neighborhood of Northern Virginia! A favorite part of my job that I enjoy very much is landscaping — figuring out which plants will work best in a particular garden, based on amount of light, soil type, water availability, and many other factors. I work a lot in Northern Virginia, an area which is notorious for clay heavy soil. I’ve been working with this type of soil for over 20 years, and through all my adventures, I’ve come across some fantastic plants that do incredibly well. For those who have hit their wall with their clay heavy soil, here are some of the most beautiful clay soil champs available. 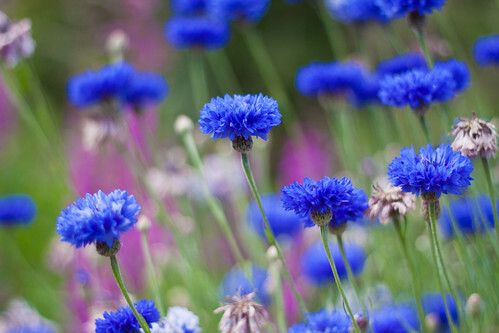 Blue Cornflower, a Kennedy favorite, is guaranteed to take your breath away. Below are some flower suggestions for those with clay-heavy soil, beginning with the irresistable Blue Cornflower. • Blue Cornflower (Centaurea cyanus) These brilliant flowers are what memories are made of — rare among “blue” flowers as they are actually blue. They are delicately fragrant and drought tolerant. This flower has a lot of history — it’s the national flower of Estonia, was used in Pharaoh Tutankhamunand’s funeral wreath, and was President Kennedy’s favorite flower, worn by John Kennedy Jr. at his wedding to honor his father. • Coneflower (Echinacea purpurea) These plants (herbs, actually) do very well in clay-heavy soil, are drought tolerant, and come in a variety of colors – the purple blooms will stop you in your tracks. They will break up soil as they grow, and are a favorite among those who practice herbal health as they have been known to boost the immune system. • Daylily ( Hemerocallis) A must grow for anyone with clay-heavy soil, they do well in a wide range of soil conditions, come in a variety of wonderful colors, and are rugged. 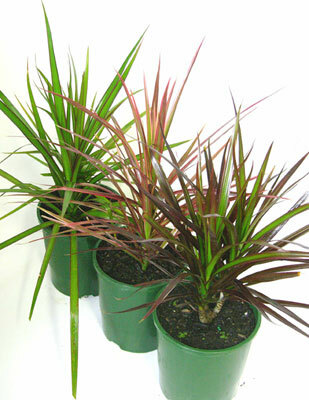 They also establish quickly, grow vigorously, and survive winters with little care. • Liriope (Liriope muscari) With spikes of tiny violet-blue flowers, this grass-like plant is named after the nymph Liropie, mother of Narcissus. The plant is a member of the lily family, has dark green, ribbonlike foliage that recurves toward the ground, and does very well in soil with clay. • Coreopsis Verticillata or Tickseed is a plant that is very tolerant of clay and its disc florets and ray florets are bright yellow that will make you smile from ear to ear, even on a not so sunny Fall day. • Black Eyed Susan (Rudbeckia) is the Maryland state flower and a cheery perennial with bright yellow petals that surround black centers. It’s a striking flower that does very well in clay soil. Plant them en masse and enjoy the show! • Shasta Daisy (Leucanthemum x superbum) With its classic daisy appearance of white petals around a yellow disc, they are attractive to bees and birds, and are drought-tolerant. 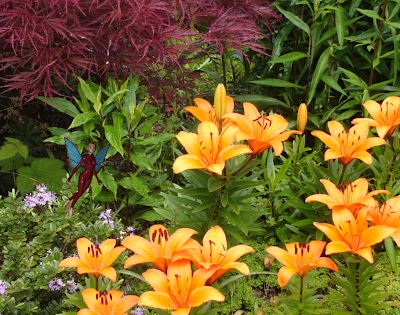 They do well in clay-heavy soil and have cheery blooms. Phlox ‘Miss Lingard’ is a GardenWise July favorite! 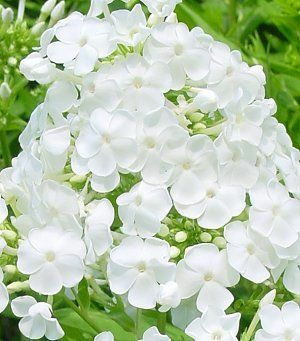 With a spectacular clump-forming habit, ‘Miss Lingard’ has spikes of sweetly-scented, refined pure white flowers that are disease resistant, so you won’t have to deal with that powdery mildew mess you sometimes get with other types of Phlox. Phlox comes from the Greek for “plant with showy flowers” and “flame,” and ‘Miss Lingard’ delivers with a gorgeous eye-catching spray of flowers. A June-August bloomer, ‘Miss Lingard’ gets 2-3 feet tall, is beautiful when planted in groups, and is our pick if you’re looking for a sophisticated garden show stopper. 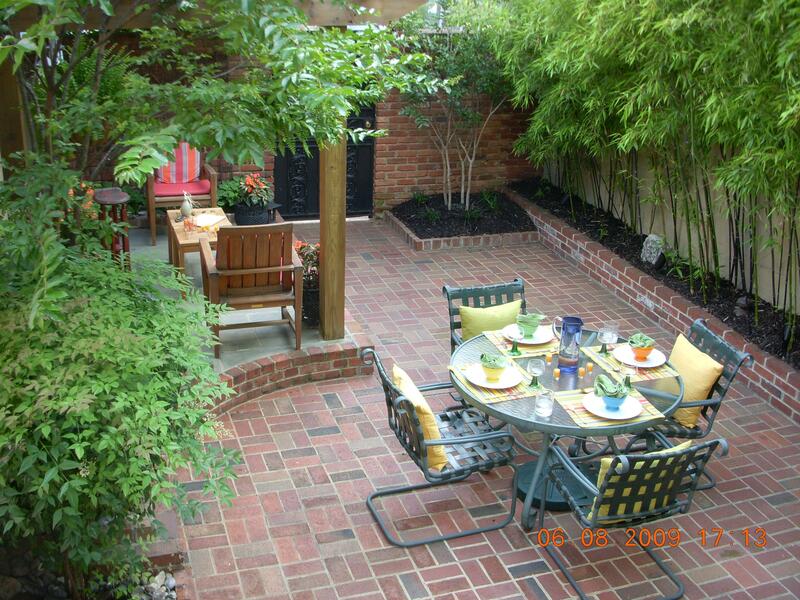 Every single brick in the above DC garden I designed and installed was recycled from a previous garden space. No bricks were purchased to create this eye-catching and sophistacted garden that has become tranquil escape for the homeowners. 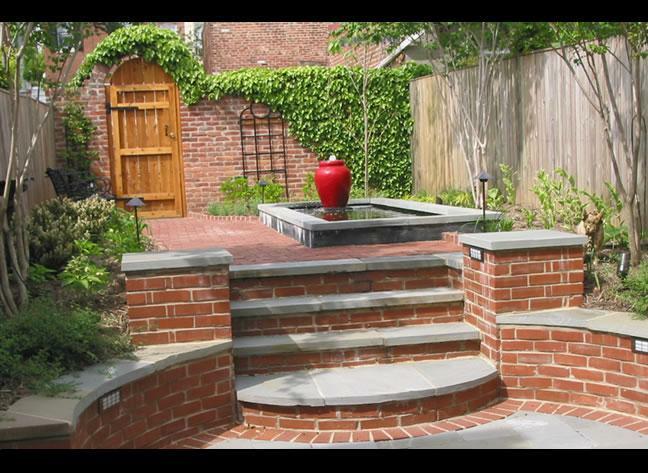 Using recycled materials in your hardscape featrures is a great “green” step to take when installing brick and stone designs. We use recycled materials when the chance to do so is available, and the possibilities are endless; recycled concrete for paving systems, glass in stepping stones, recycled bricks, and crushed stone and granite to be used in patio surfaces. An added bonus? You save money. When I incorporate larger pieces of old concrete or bricks into a design, the purchase and delivery of new materials is eliminated. Also eliminated? The material removal and disposal costs. 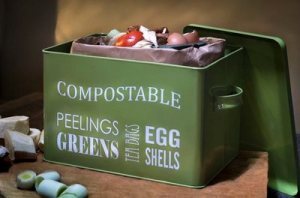 We challenge you to put your creative caps on and think about what you can recycle in your garden space — the sky’s the limit, and the results can be life changing. Sweet Woodruff (Galium odoratum) is a shade garden delight, and the perfect groundcover for adding fragrance to your outside space while reducing lawn areas. Easily grown in average, medium to wet, well-drained soils, it’s fast growing, insect repellent, low maintainance, quick to establish and it isn’t prone to invasiveness — though you definitely do need to keep it in check. 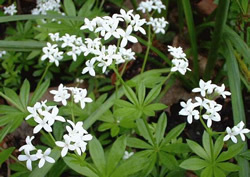 Sweet Woodruff has white spring flowers and an attractive eye-catching foilage. The foliage’s scent intensifies when the flowers are dried, which makes them a popular choice for those making potpourri. Some areas are lucky to have clay-heavy soil, something I think about often as I work often in the clay heavy soil of Northern Virginia. I use the word lucky because I have the opportunity to share some of the most beautiful clay heavy soil survivors, with blooms that will take your breath away. 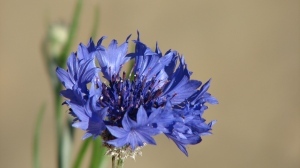 Below are some suggestions for those with clay-heavy soil, beginning with the irresistable Blue Cornflower. • Coneflower (Echinacea purpurea) These plants (herbs, actually) do very well in clay-heavy soil, are drought tolerant, and come in a variety of colors — the purple blooms will stop you in your tracks. They will break up soil as they grow, and are a favorite among those who practice herbal health as they have been known to boost the immune system. An exciting and inexpensive way to bring the “pop” back into your garden spaces is to add new colors to your existing color pallette for a nice dramatic change. Each winter we look forward to new and interesting color ideas for the upcoming year. 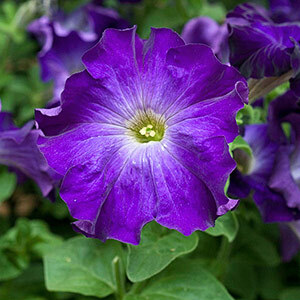 There have been new Petunia colors over the past couple of years that have quickly become a staple in many gardens, and one in particular, the eye-catching Sophistica Blue Morn, which was hailed by Better Homes & Gardens as a real show stopper. It’s a flower that is easy to plant and care for, that will add wonderful bright color to your garden spaces. I also liked some other Petunia offerings a coupel of years ago, including the Rhythm and Blues, Supertunia Pretty Much Picasso , Famous Violet Picotee and the Shock Wave Denim Petunias. Be sure to take a look at the Tex Mex Hot Pink Geranium, which is one of the more heat-resistant Geraniums. Vines can play a key role in a garden space. These wonderful and adventurous climbing plants create vertical interest as they wrap themselves around garden elements, such as gazebos, arbors and trellises, adding new dimensions and important focal points. They can also soften architecture and disguise areas that aren’t fully developed. 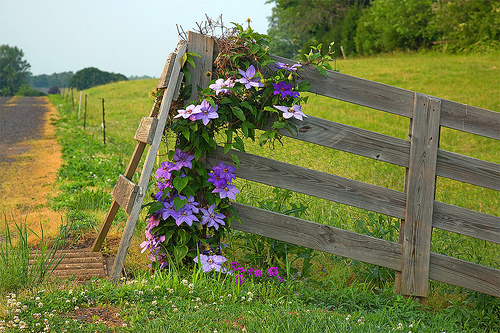 Strategically placed, vines can also hide areas that are out of our control, such as a neighbor’s unsightly yard! One of my favorites, clematis had large and showy flowers, and is a real show stopper. 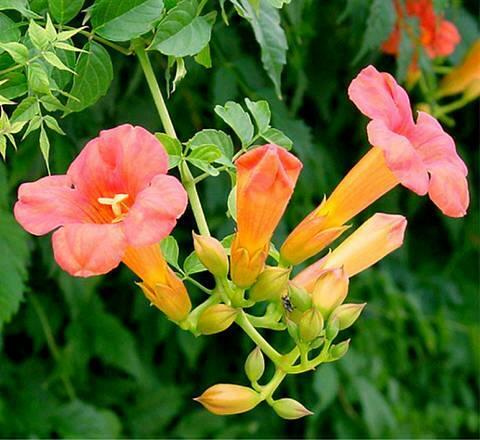 Another favorite is trumpet vine with its red and orange tubular flowers, which is also native to the greater DC area. An added bonus? Trumpet Vine attracts hummingbirds, always awelcome guest in my garden areas. They prefer full sun and fertile, well-drained soil. If there are no architectural elements in your garden, vines, such as clematis, can also be used as ground cover, which can replace some lawn areas, giving you an additional “green” garden step that will help you save money on watering. 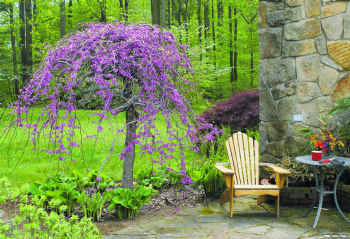 The Weeping Redbud is a gorgeous and fascinating tree — it’s a favorite. 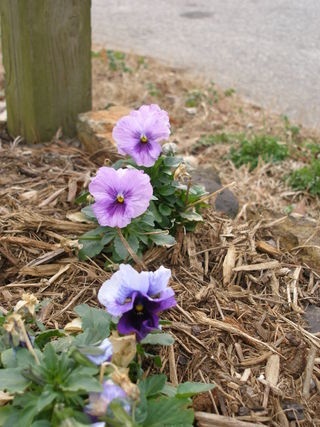 They are hardy in zones 5-8 and actually require a little cold weather to encourage budding. 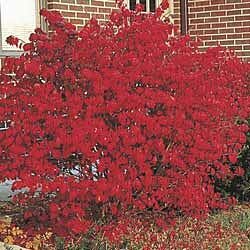 They can handle partial shade but prefer sun — and be sure to plant the tree in well drained soil. A Weeping Redbud tree does not grow very well in hot temperatures – if possible, plant it under the shade of other trees and use organic fertilizer for the best results. A small tree, it produces beautiful magenta-pink flowers in spring that will make any passerby stop and take a closer look as the trunk will twist and weep into an umbrella shape that will be different on each tree, no two are the same! Weeping Redbud does not like to be transplanted and they thrive with sun. Give yourself the gift of a Weping Redbud, you’ll thank yourself for many years to come. 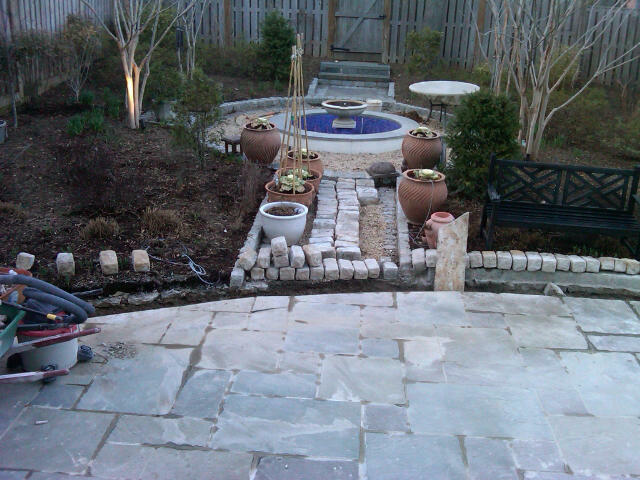 Last year I took on a project to repitch and reset a flagstone patio with a Belgian block border that had been installed eight years ago. Below are some “during” and “after” pictures. The patio was built for a new construction home. After the house settled a bit, the rear patio did as well and run off water wasn’t draining away from the patio. 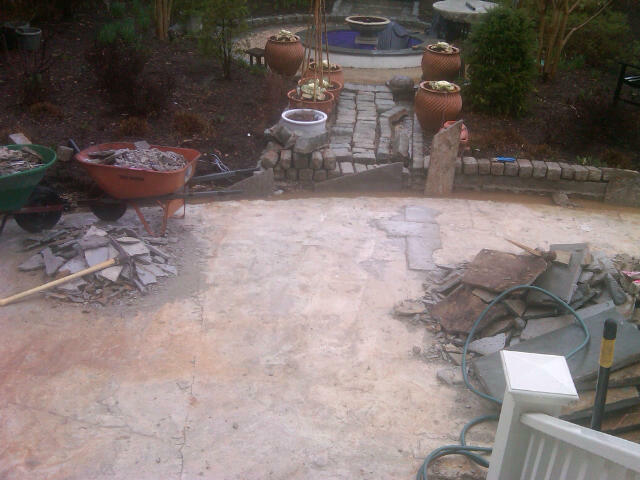 The project was not costly yet very important to do to correct and extend the life of the patio for another decade. By solving the problem early, I saved the homewners a lot of grief and future headaches. I don’t have to go very far to check on this project because it’s my own backyard! Yes, when my landscape architect (me!) talks, I listen. I made the corrections to our patio just in time to enjoy our garden for spring and summer. And once again our run off water is flowing freely to the surrounding landscape and drains. If you see lingering puddles of water in your landscape, there may be a larger problem looming on the horizon. 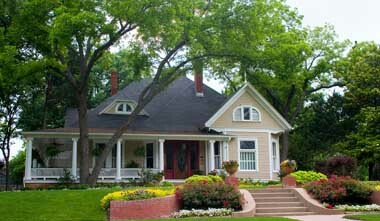 If you act in a reasonable amount of time, an inexpensive solution can extend the life of your beloved landscape and prevent larger and more expensive problems down the road. National Gardening Exercise Day is Sunday, June 6! Sunday is National Gardening Exercise Day, and many who have a passion for maintaining our gardens know that working with plants is good for us both physically and mentally. Gardening is a moderate, and sometimes strenuous form of exercise that incorporates many important elements of exercise regimes, such as stretching, repetition of movement, and even resistance principles similar to weight training, while expending calories. 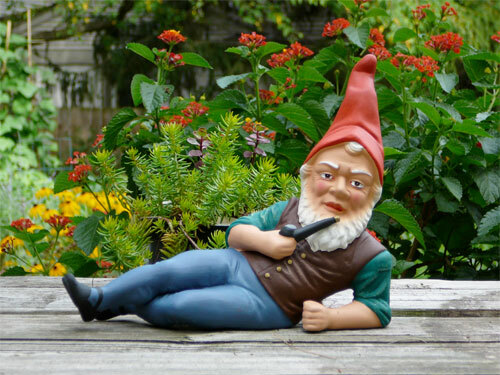 It’s important to remember to warm up your muscles by stretching a bit before gardening. We should also use proper techniques for lifting objects, bending, and carrying — don’t forget to bend with your knees! You don’t want to end up in your bedroom on a beautiful Sunday morning with a pulled back muscle. Unlike many exercise options, when keeping up with a growing garden, you can be involved in what you’re doing, stay healthy, AND still take time to smell the roses! Curb Appeal in a Day – My House! An easy way to create effective curb appeal is to frame an entry to your home. A couple of containers dropped into the right spot will not only add a welcome addition of color, but all eyes will be drawn to your new focal point. It’s a simple way to make a great change the front of your home. The bonus? It’s a project that can be completed in a single afternoon. Find a container that makes a dramatic statement. 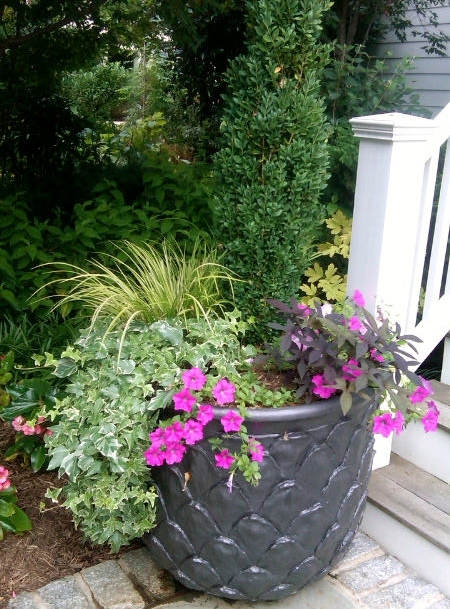 And think about what colors will have the greatest impact without taking away from your existing landscape — you want your new containers to blend in. I added two over-sized containers, below, to my front landscape, and I change the flowers and plants as often as the spirit moves me. This month at my own home I’ve added purple and Lavendar ‘Wave’ Petunias with Ipomea ‘Blackie’; Black Potatoe Vine and Carex d. ‘Kaga-nishiki’; and Gold Fountains Sedge. The purble gently guides the eye to my front door. We’re always looking out for fun family garden projects — last season we wrote about a fun Fall project centered on planting bulbs for Spring. Now you and your whole family can start your herb and vegetable garden indoors! Yes, starting cool season seeds indoors is a great project for the whole family. Cool season herbs and vegetables can be started from seeds indoors over the next two weeks for plantig outside in April. 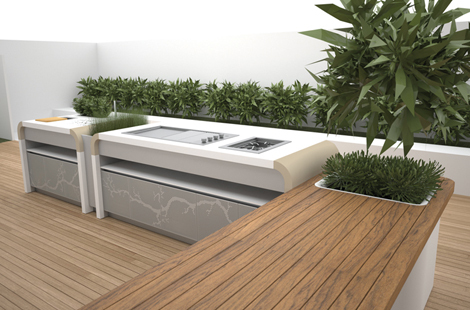 Each member of the family can be in charge of two or three vegetables/herbs each, with an assigned space in the yard. Seeds you can grow indoors right now include lettuce, celeriac, spinach, arugula, endive, onions and leeks. A second project for next month can include planting peas, radishes, and carrots, which should be sown directly into the soil in mid-to-late March. 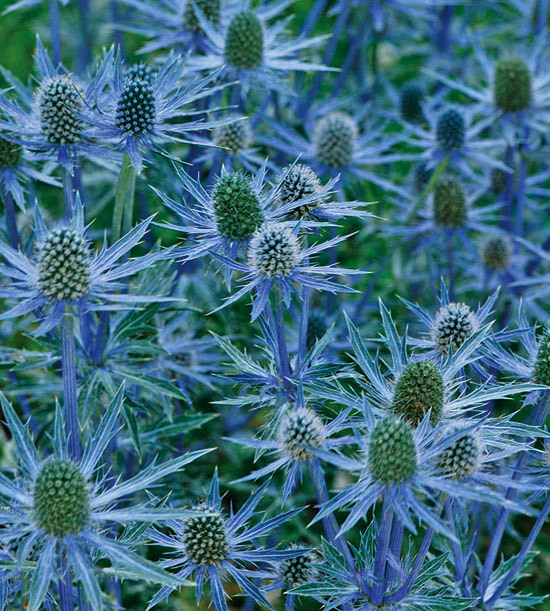 A flower we need to share with everyone today is great for any sunny garden and areas with well-drained soil — ‘Big Blue’ Sea Holly. It’s drought and deer resistant, and grow as tall as three feet. Rabbits have appeared in much larger numbers this year in many of the Northern Virginia neighborhoods closer to DC, such as Cherrydale, and the Sea Holly is also rabbit resistant, so plant away everyone in NOVA! 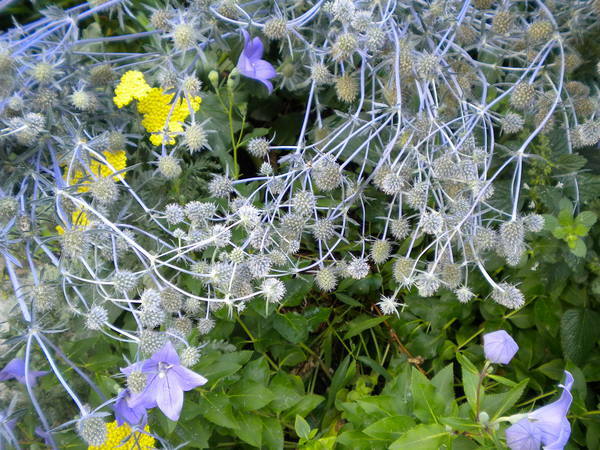 The silvery-blue flowers, which bloom in mid-summer, will take your breath away when they’re in full bloom. I pair my Sea Holly with Yarrow and Balloon Flower, pictured to the right, and they’re a trio of old friends I can’t wait to see in my home garden each year. Here’s a pic I took last year at home. When they’re in bloom with such wonderful colors and textures, I smile every time I see them, knowing that summer has arrived and will be staying around for a while. Feed the Soil not the Plant. Plant health depends on healthy roots; healthy roots depend on healthy soil for air, water and nutrients delivered in forms plants can use. 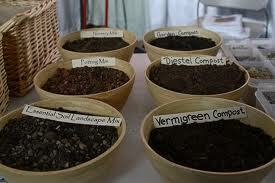 Soil that is rich in organic matter, aka compost, is rich in nutrients and in the life that makes those nutrients available to the plants (bacteria, worms, etc.) . Ornamental plants in good soil usually do not need added fertilizer, and crop plants that do need extra food need less of it when it’s released slowly by friendly soil from things such as rock powders, kelp and green manures. I work often in the clay heavy soil of Northern Virginia, which means I have the opportunity to share some of the most beautiful clay soil survivors, with blooms that will take your breath away. Blue Cornflower, a Kennedy favorite, and more are guaranteed to take your breath away. Below are some suggestions for those with clay-heavy soil, beginning with the irresistable Blue Cornflower. The main maintenance task for hyacinths is called deadheading. Deadheading is simply pinching off old blooms to encourage new growth and transfer energy from making seeds. However, if you bought a self-sowing variety do not deadhead because you will lose the seeds. The only other concerns for hyacinth bulbs is the occasional animal or rodent. If you notice missing bulbs and see signs of them being dug up, put up a barrier or fence to discourage intruders. If no signs of digging around missing bulbs are apparent then you may have a rodent problem. In this case you can protect the bulb by simply digging it up and putting a wire mesh in the hole to surround the bulb. How Thirsty Are Your Plants? Author and gardener Pamela Crawford is profiled by Steve Bender in the April 2010 issue of Southern Living. Pamela is an expert on growing beautiful flowers while saving water, money and time. In the profile, Pamela provides Southern Living readers with a ranking of nine popular plants according to their water needs , Teetotalers (“these stalwarts never take a drink”), Moderate Drinkers (water 3x a week), and Problem Drinkers (water 6x a week). Click below to enlarge the picture. 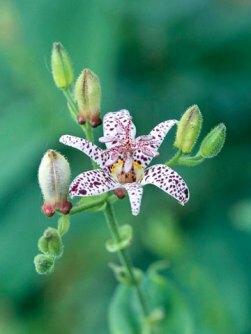 One of my all time favorites, and a recent top choice by GardenWise as a “must-have” Fall 2010 garden favorite, is Toad Lily (Tricyrtis.) As I earlier wrote, Toad Lily, with its beautiful orchid-like white flowers, purple flecks and graceful arching growth habit, compels anyone who gazes upon it to stop and take a closer look. 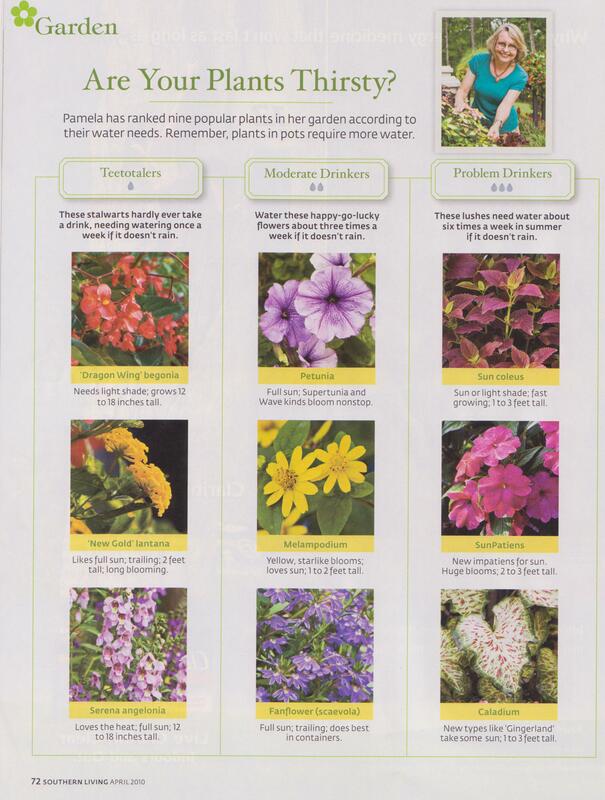 Better Homes & Gardens lists Toad Lily as one of their best perennials for shade, and I’m thrilled that more attention is pointed in this fantastic perennial’s directon. 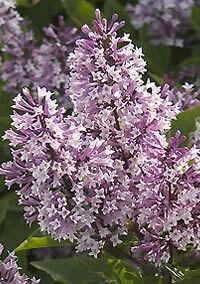 Make your shade explode with interest and color by adding the unforgetable beauty of Toad Lily. Ease of movement and flow are essential when connecting indoor and outdoor spaces. Outside rooms designed for relaxation and recreation will add new living areas to your property whiole increasing your home’s value by as much as 15%. Not a bad return on a project meant to help you make the most of your property — which you already own! Designing and installing fresh, exciting and timeless landscape architectural designs that remain functional are key to the spaces I create for clients. This week we’re going to explore outside living possibilities. First up? Outdoor “living rooms,” which became popular after the Sept. 11th terrorist attacks. These spaces gained even more popularity in 2007 as an uncertain economy became a regular presence in our lives. I design a smaller version of these spaces that I call “cocoon” spaces which comfort and inspire. 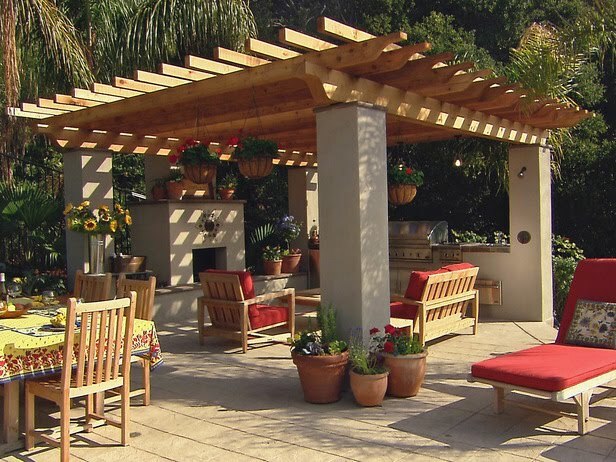 Outdoor living rooms are the second most popular home remodeling project after remodeling of a kitchen. These spaces can include fireplaces or firepits, a cooking station and comfortable seating. They can also reflect your own distinct personality while providing a welcome getaway for family and friends. Kitchens add value to any home, and an outside kitchen will most definitely increase your home’s value. It’s important to work with a professional on this type of living space. Landscape architects are educated in how to design these types of outdoor living areas, properly locate and install them, and take all of the architectural elements into considerations (grading, etc.) so there will be no problems down the road. It’s time to demystify the word “organic” because it’s 2013, and growing organic produce and transforming a garden space into an “organic” garden is easily achieved. When gardeners and other folks refer to organic produce or organically grown veggies and fruit, they’re describing items grown in a garden space that has replaced pesticides with natural substitutes, and building soil life so plants are healthier. Anyone can grow their own organic veggies and fruit in any sized space, and best of all, this is a simple DIY transformation that doesn’t take much effort and yields healthier and delicious results! For those who desire a more green and healthy approach to your gardening adventure, check out Doug Hall’s blog over at Organic Gardening, ORGANIC GARDENING SOLUTIONS . Doug has great tips and ideas for those seeking a more organic approach, and he covers so many timely topics. It’s always a great read. Ease of movement and flow are essential when connecting your indoor and outdoor spaces. 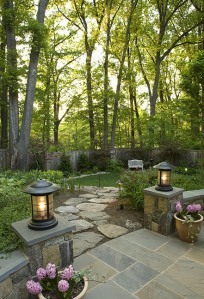 Think of your outside space as a room, and what’s the first question that comes to mind? “How will I get there?” This can easily be achieved, especially in an older home, with a few additions. Replace a solid door with a door with glass, add some wooden stairs, and your journey begins. Create functional areas for entertaining, focal points with water, and smaller areas for intimate conversation. And be sure to make it personal! This is one of those times where it is all about you. Add meaningful touches to your space. What were your favorite flowers growing up? Which trees do you remember at your grandparent’s home? Which flowers were used on your wedding day? Personal touches with visual touchstones to memories and past experiences will create a thoughtful and intimate space for you to enjoy for many years. 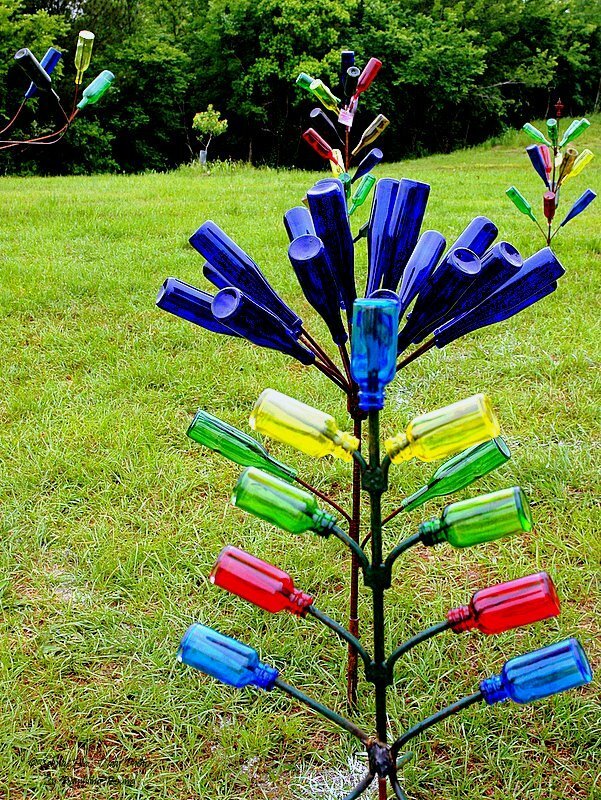 A thoughtful way to live a greener life in the new year is to make your landscape eco-friendly and plant trees. Planting a tree is one of the most immediate green steps you can take as trees absorb CO2 and other dangerous gasses while replenishing the atmosphere with oxygen. Fruit bearing trees will also absorb dangerous gasses while replenishing oxygen, and a plus is your garden becomes more productive. While enjoying your favorite fruits and saving a little money at the grocery store, you can also donate any extra fruit to those in need. Not only will you help others in your immediate community, but you’ll show by example how Green Living can give back, both locally and globally. Bearded Iris- Colors: Pink, white, purple or yellow and will bloom mid-to late spring. Needs full sun, and will be 12 to 36 in. tall. 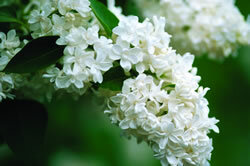 Common lilac- Colors: Pink, purple or white and will bloom in midspring. They need full sun, and will be 8 to 15ft. tall, 6 to 10ft. wide. 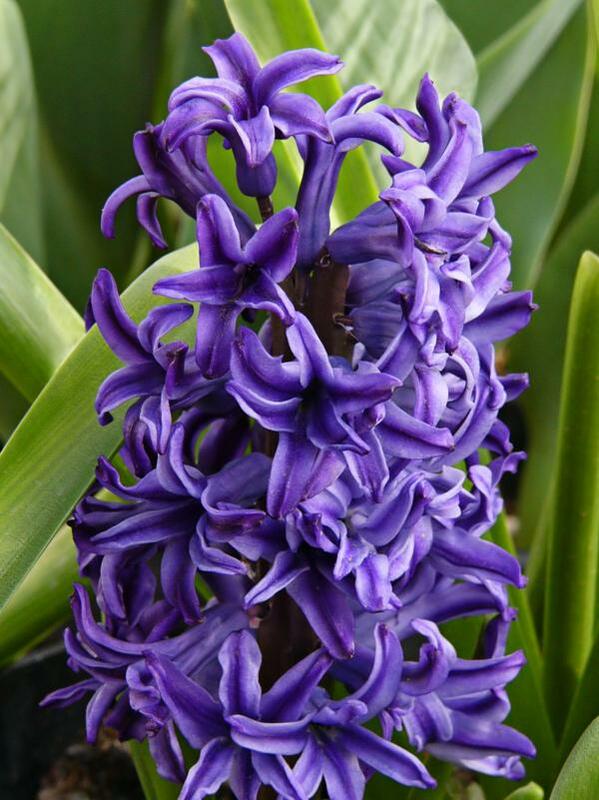 Hyacinth- Colors: Blue, white, pink, peach or purple and will bloom in early spring. They need full sun and will grow to be 6 to 12 in. tall, 3 to 5in. wide. Plants play a very important role in a healthy ecosystem. 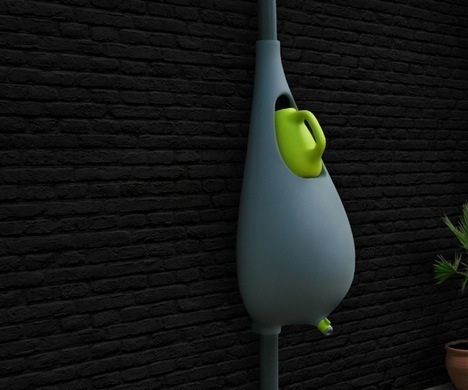 They reduce pollutants, oxygenate the atmosphere, and are important to overall human health. 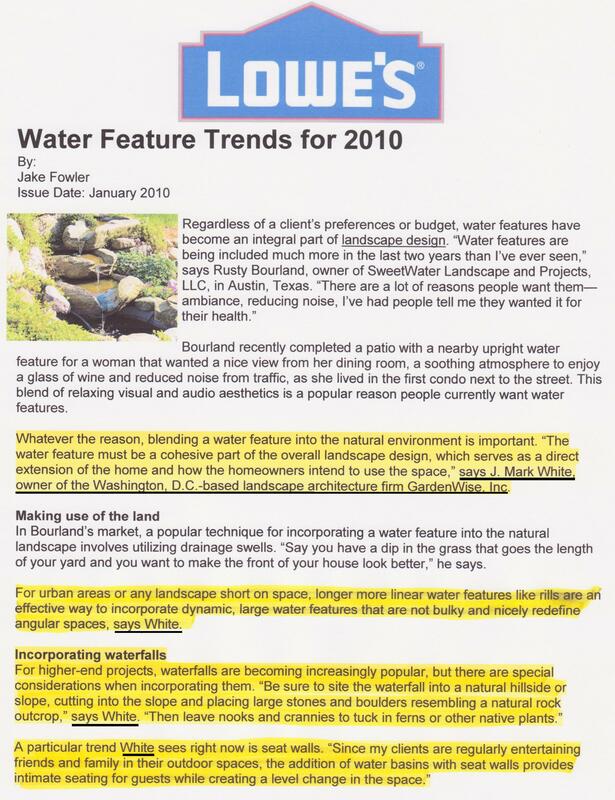 By using a comprehensive approach to sustainable landscape design, Sustainable Residential Landscape Architecture (SRLA) practices can improve water and energy efficiency while using plants to eliminate chemical fertilizers, produce food, and clean the air. Homeowners can use plants to recreate healthy ecosystems and reduce some of the negative effects of residential buildings. 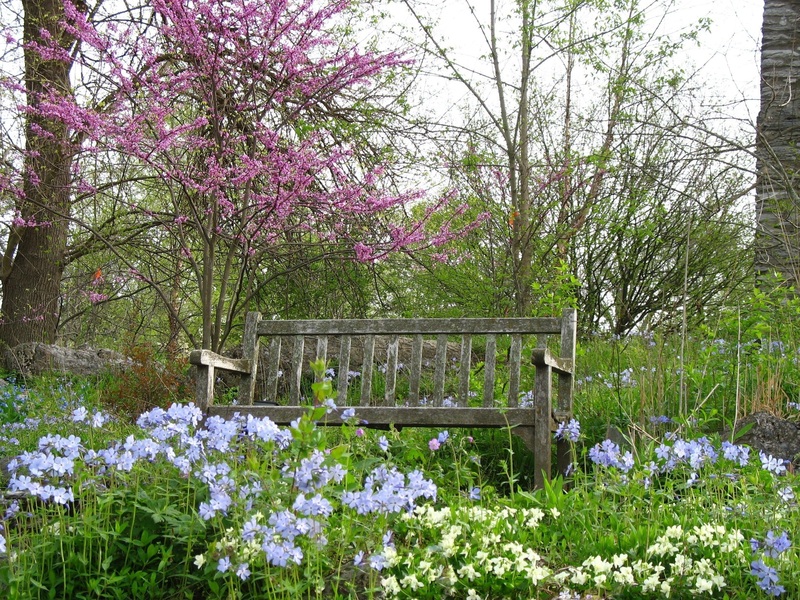 There are many simple ways to experience the benefits of plants — restoring native plants to residential landscapes, using plants as food sources, creating wildlife habitats through the strategic use of plantings, and adding indoor plants to improve air quality inside your home. If included as part of your master landscape design plan, SRLA can help you use plants to cut down on the use of chemical fertilizers and pesticides. And as we all know, cutting outr chemicals in our residential gardens will make for a healthier home, and life. When a gardener asks, “How can I make my garden ‘green’?” The journey has begun. A thoughtful understanding that an outside space can have a positive impact on the environment is the first step to a green garden makeover. An exciting weekend project that will bring immediate and amazing results is to reduce your lawn area by at least half. Substituting lawn areas with ground covers will provide beautiful colors and textures to your garden spaces. Ground covers retain moisture in the soil, help prevent erosion, and require significantly less water than grass, which will make your garden space eco-friendly. Creeping thymes and Creeping Jenny are good choices for sunny spots, and for shadier areas, tiny creeping mints such as Mentha requienii will work well. Some nice low-water choices include Trailing Yellow Dalea and Trailing lantana. By adding some stone elements and pourous pavers into your plan, your garden space will come alive with wonderful garden paths that will add new dimensions to your garden spaces. 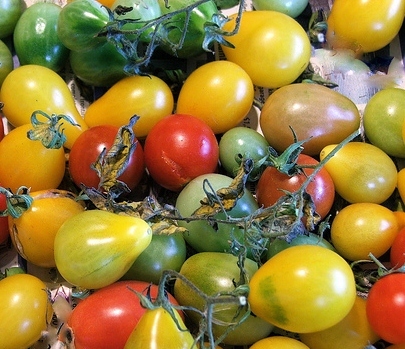 As the warmer weather approaches and we find outselves leaving the house without a wool cap and gloves, here are some March gardening tips for Mid-Atlantic gardeners. Even on this rainy day you can start making plans for your March garden work, incuding bulb planting. 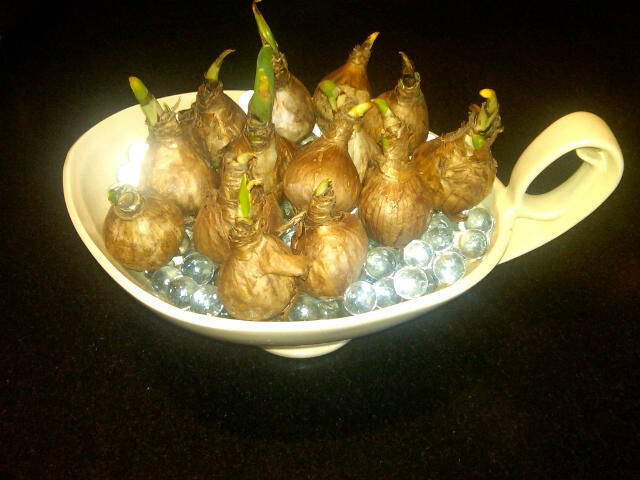 Pictured are Narcissus bulbs I’m preparing to plant. This February is much different than past Februarys. It’s not as cold, and it’s not as snowy, icy, or rainy. However, we still have winter garden chores! Start by checking your perennial plants. You can protect your strawberries and many perennial flowers as well as garlic, over-wintered spinach, and other crops that can easily be damaged by alternate warming and freezing of the soil with mulch. Although it is too late to undo any damage that’s done, mulching now can prevent additional damage caused by spring fluctuations in soil temperatures. You can also take a walk around the garden to check for winter damage to shrubs, evergreens, and trees. Look for damage by rabbits and rodents, too. We have a lot of rabbits in our area this year, so be sure to understand who is causing garden damage before coming up with a solution. February is also a great time to think about the birds. In addition to keeping the feeders full, you can attract them to your yard and garden next spring by adding a birdhouse now.